Below the cut…. it’s not so bad to be bald. Still recognise you as the great Elaine. No real harm done. Keep up the good work. I’m impressed with your lovely photo. 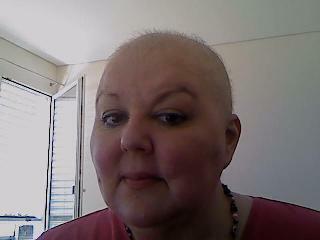 As you know, I haven’t ‘dared’ to post a photo of myself bald yet. I don’t know why it’s such a big deal. Maybe some day. Thanks for sharing yours. Thanks. You know you don’t have to post a photo though. Part of it for me was being far away from most of my family and friends and wanting them to see it was ok. Maybe I needed to see that too. But it doesn’t work the same for everyone. Now I have to replace my profile pic here and on twitter at some point since the long dark hair is history. Sort of sad about that tho, although I like my new hair. Ah hair…. Take care & thanks for commenting!